With an ever-growing list of titles, we have built up considerable expertise and knowledge of publishing and are able to draw on a pool of talented Lebanese writers, graphic designers, photographers, artists, editors and printers to consistently release first rate material. Harness Your Creativity is a practical tool book to help you enhance your own, natural creativity. Written by founder of fadein Nadia Tabbara, this book will push your potential in life and at work past its limits. Creativity is demanded of us on a daily basis, both personally and professionally, and when used properly, it gives us a competitive edge. 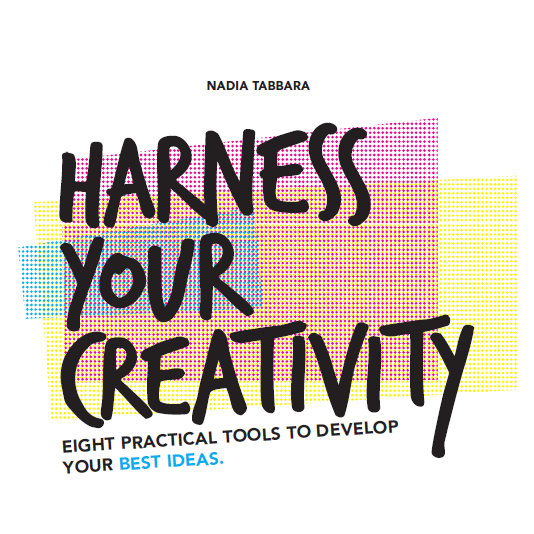 Author, Nadia Tabbara, explains how creativity is not something that a person does or does not have; rather it is a learned skill to be taught and practiced. With these 8 practical tools you will discover your natural creativity; acquire the knowledge you need to nourish it, the belief it takes to secure it and finally, the skills you need to put your creativity into action. With a mix of scientific research, philosophy and real-life experience, this is not a book that lectures; it’s one that pushes you to take action. Nadia Tabbara is a writer and creativity coach who has been researching, developing and testing her creative methodology for over a decade. She has coached various types of profiles, from entrepreneurs to artists, and continues to do so in Beirut, Lebanon where she is based. In 2005, she received her BA in both Film and Writing from Emerson College in Boston and headed to New York City where she would work in the Film industry for over 5 years on major Hollywood films such as “Step Up 3D”, “The Adjustment Bureau” and “New York, I Love You” and popular TV shows such as “Bored to Death” and “The Good Wife.” During this time, she continued her training with award-winning screenwriter Jacob Krueger, where she spent over 2 years in his specialized studio finishing her first (of many) feature film screenplays. She moved back to Lebanon in 2011 and has since opened FADE IN:, growing it into a writing hub focused on educating aspiring writers on the creative process. She is also a professional screenwriter, heading her Writers Room to create internationally competitive television content.